Tina Fey and Amy Poehler think the force is with them. One starring Tina Fey and Amy Poehler. Their movie Sisters comes out the same weekend as the highly anticipated Star Wars: The Force Awakens. Even before it opens Dec. 18, the J.J. Abrams-directed sequel is being called "the biggest movie of the year." Analysts predict Star Wars will crush the competition, taking in more than $200 million on opening weekend. A comedy such as Sisters is expected to do around $15 million. But Fey and Poehler are keeping their beloved wits about them. 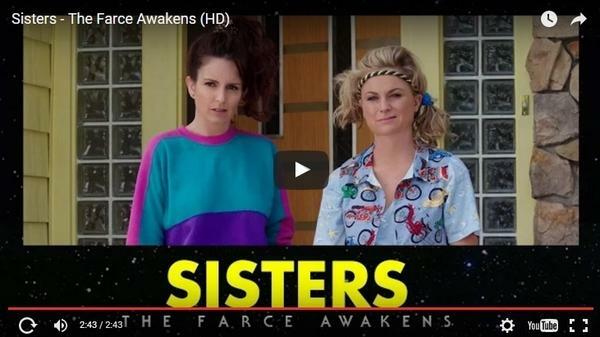 "R2-D2 is my bra size," Fey says in a new marketing video for Sisters called "The Farce Awakens." Fellow SNL alumna Maya Rudolph does a Chewbacca impression in the video. And Sisters leading man Ike Barinholtz confesses: "Growing up I had a Sisters lunchbox. I had all the Sisters toys." See the parallels? When NPR asked Fey and Poehler about going up against Star Wars, they kept the joke going. "I mean, I feel bad for them because I know they're worried," says Fey. "JJ Abrams called me and begged me," said Poehler. Fey claimed Abrams was "crying" because he was worried their comedy about middle-aged sisters who throw a party would overwhelm his Stormtroopers, lightsabers and beloved robots. The comedians joked that it was Abrams who wanted them to change their opening date. Fey said: "And I was like, 'If we back off the date, then so, what? You'll win the date. But you'll win by forfeit. That's not going to be good for you. Better to come in second.' "
As Poehler pointed out, in all seriousness, the fan bases for the two movies are different: "I know this is crazy, but there might be some people who aren't interested in Star Wars." Fey chimed in, "I don't think so." Still, Poehler and Fey hope to get some crossover, and are urging fans to tweet #YouCanSeeThemBoth. They are.